I haven’t read “The Life-Changing Magic of Tidying Up” yet, but I’ve peeked at enough blog posts about it to know that it recommends putting all like items together. That’s how I came to this stunning arrangement on my basement floor today. And those are just the empty ones! I already instituted another recommendation in the book — organizing my drawers vertically, so I could see the contents at a glance. 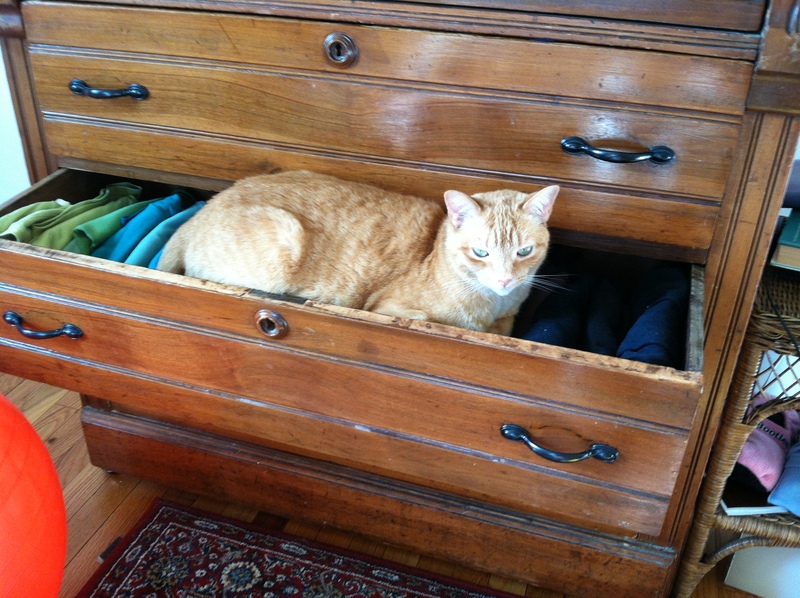 The only issue with this is that it exposes a lot more shirts to cat hair when somebody decides that looks like an excellent spot to hang out on. And by the way, if I had started this process earlier, I would have known that I already had a lifetime supply of dolomitic lime in an old cat litter container in the garage before I drove out to Agway to get more. No doubt I should try to relate this to writing somehow. Perhaps freeing myself from clutter could be seen as clearing the deck so I can get down and focus. More likely it’s just another way of procrastinating. Meanwhile, I haven’t actually given away any of those baskets yet. I’ve just created a tower of them. If I were Cassandra in The Ribs and Thigh Bones of Desire, I could probably find a way to make an art installation out of it, though I’d need to find a way to sexualize it a lot more obviously. If I were Professor Kinney at UMass, I would probably already see something sexual about it (bowls and baskets are very feminine in Freudian criticism). For myself, they are (mostly) each lovely in themselves, and they represent potential. Potential storage, potential gift baskets, potential decoration, potential cat beds… but there’s such a thing as having too much potential. Where does potential end and become hoarding? 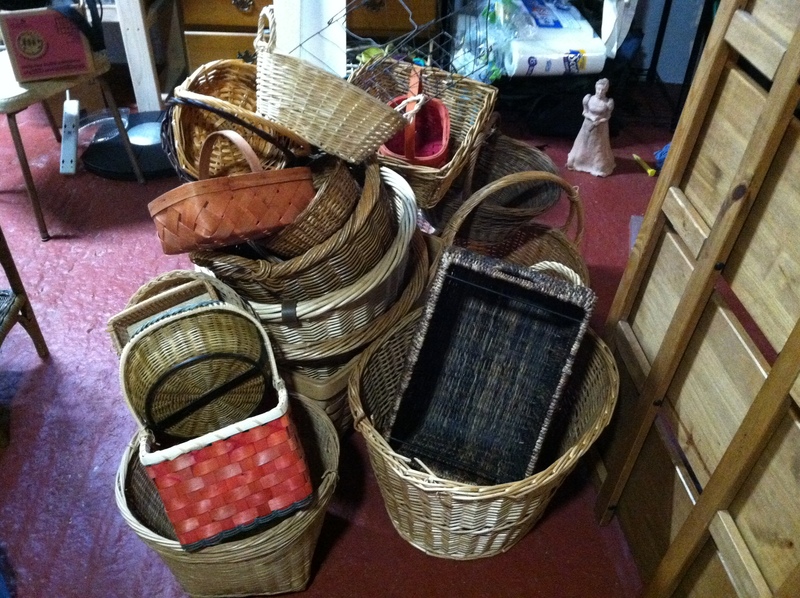 And no, I don’t want to be a basket collector. At this point in my life I don’t want to collect anything other than writing credits and book reviews. What do YOU accumulate too much of against all reason?